Centrifugal pumps are usually available with a single impeller. This facilitates in creating a differential pressure exceeding 150 psid. This is often created between the suction and the discharge. These pumps are complex, special and very expensive to design. This is also reason that people are looking for an affordable approach. Multistage pumps have been introduced for this purpose. These serve as the best alternatives for expensive and complex to design and operate centrifugal pumps. Many internal channels of the multistage gasoline water pump casing make way to the discharge of single impeller to a different impeller’s suction point. Water in a multistage pump gets into the pump starting from the top left and then passes through all 4 impellers in series. These start from left and then go to right. The water starts from the volute and circumscribes an impeller’s discharge towards the suction in the adjoining impeller. A Diesel High Pressure Water Pump stage can be referred to as a section that is defined as that portion of a centrifugal pump that comprises of one impeller and many related components. 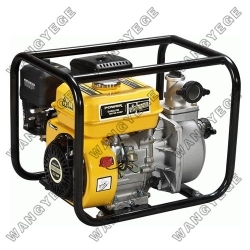 Most of the centrifugal pumps are known to be single-stage Portable Gasoline Water Pump. These pumps contain a single impeller. Any pump that contains about 7 within a single housing is referred to as a 7-stage pump. These are most commonly known as a multi-stage pump. All multistage pumps are designed in a fashion to adhere to high head, low flow operations. For all kinds of pumping requirements, a high quality multistage pump will work towards offering enhanced heads, high discharge pressures via running the fluid. This fluid flows from a single impeller to the suction of one that follows.